"If you work or interact with people in different countries you’ll know what a pain it can be to coordinate a meeting with the parties are in different timezones. Do you simultaneously work on several projects worldwide? Adjust group calls or corporate meetings without any affords. 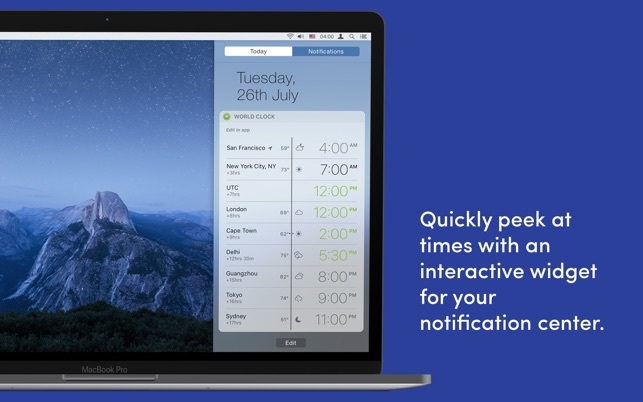 Add cities and timezones like GMT and UTC with a click. Enjoy a brand-new experience of planning and scheduling! When it comes to arranging calls and meetings through a number of time zones, this world time zone clock makes a great solution. Select the preferable time zones and add them to Favourites. For better visualization, have a peek at the needed areas on a map. 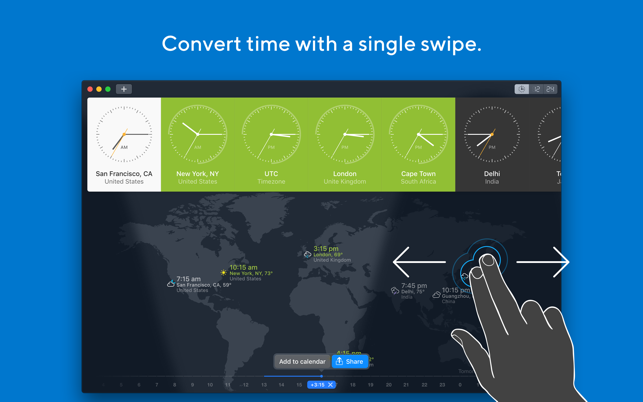 Convert times throughout the world within seconds, plan travel or check flight arrival time across time zones. 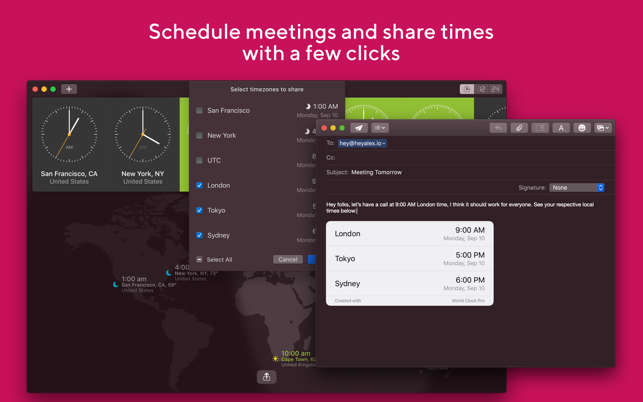 Pick good meeting times for colleagues f rom different countries with a drag of a cursor. Effortlessly choose the preferable time for all of them. 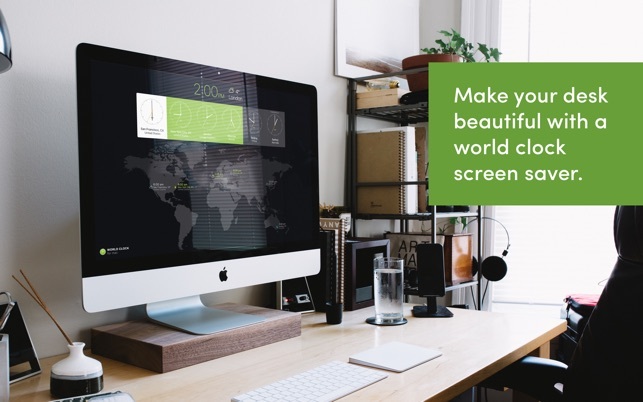 Sense gentle clicks with your fingers, every time you pass an hour mark when scrolling time using a touch pad. 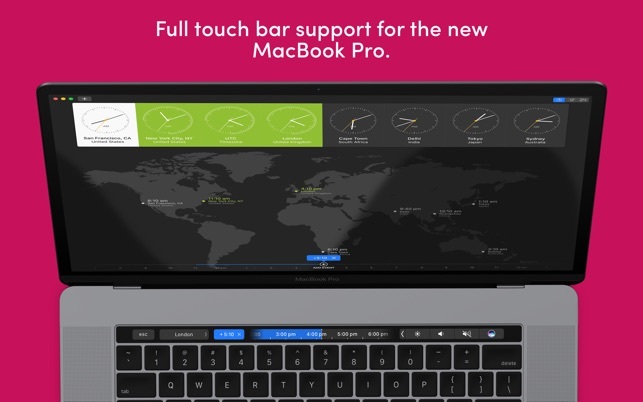 Works newer Macs with a touch bar that supports force touch and haptic feedback. Subscribe to get access to time conversion, daily weather forecasts, calendar events creation and instant and timely automatic updates of our timezone database of more than 142,000 locations and timezones. — Simplified and more powerful sharing: find a time that suits, and instantly share it with the others. Easily toggle between 12-hour digital, 12-hour analog and 24-hour military-time clock faces. 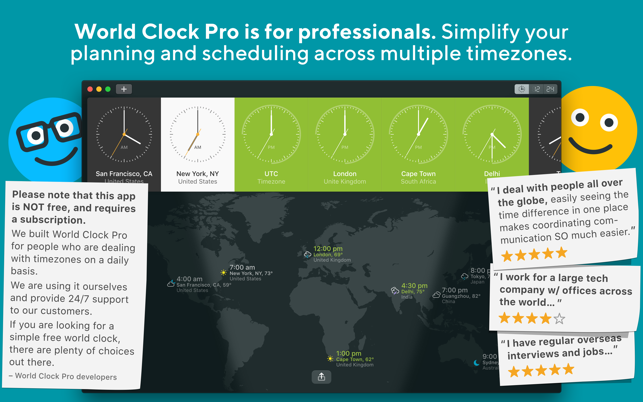 Now you can choose whether you want your World Clock Pro to sit in dock, or in the menu bar next to the system clock. Whatever works best, your choice. We cleaned up the UI a bit to make it less cluttered and more self evident. 1.6.2 - bugfixes related to Japanese / Chinese system language and application auto-start. And as usual, we made a few bug fixes and minor improvements. P. S. Please leave us a review on the AppStore, to help us continue improving the app. — Minor improvements & fixes. all new users can download the app for free, but will need to subscribe on yearly or monthly basis to use time conversion, weather and database updates. There is also a 30 day trial option. — Returned weather to the widget (popular request). — Added a setting to toggle weather on/off in the widget and on the main map. Many people have asked for it. We thought it's a great idea too. Time to make your desk look cool. Current weather is now displayed for every city on the map. Know what awaits you during your travels or have something to talk about with your remote buddies. The menu bar mode on a Mac is a great way to quickly access the app. Great app for finding the right time to call people and arrange meetings across several timezone - the best of many I’ve tried.